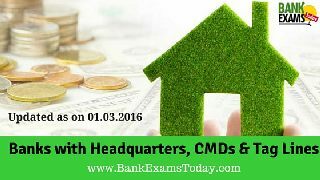 Today we presenting you a short note on Banks with Headquarters, CMDs & Tag Lines (updated as on 01.03.2016) which is very important for your upcoming LIC AAO 2016. We also proving you a free PDF on this topic. You may download for your future reference.